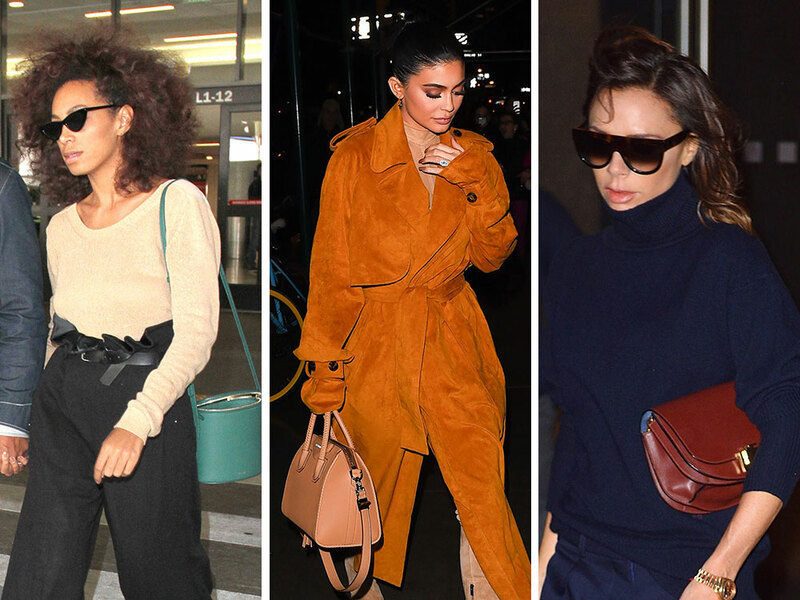 Celebs are stepping up their bag games on both coasts during New York Fashion Week, and the results are surprisingly geometrical. And in addition to the usual suspects like Louis Vuitton and Givenchy, we have a host of appealing new styles from edgy, up-and-coming brands like Cuero & Mor and subtle historical favorites like Moynat. These fresh designs make me think our poor eyes have grown far too accustomed to the usual satchel, tote and clutch shapes. Chloë Sevigny was recently spotted carrying this black leather Miu Miu Madras Tote while shopping in NYC for even more Miu Miu. If the bag looks a bit like an accordion on the bottom, it's because it has a lot of pockets and compartments. Dakota Johnson has dutifully carried this Louis Vuitton Noé Bag for the duration of her 50 Shades Darker promo tour. Here she is carrying it at LAX, where I assume she is headed home, but then right back out to do more promo through the weekend. Here's Kylie Jenner heading into Nobu in NYC with an petite tan version of the Givenchy Antigona. It pairs nicely with her long suede trench coat. Selena Gomez looks extra cozy while exiting her NYC hotel with her new bag du jour, the Coach Rogue Bag. We saw her carrying this same bag earlier this week. Selena seems to be the new face of Coach in 2017, but it may be more than just a modeling gig. You can see more of her brand faves at Coach. Paps spotted Solange carrying this charming peacock blue Cuero & Mor Small Bucket Bag while leaving LAX with her husband. This particular bag hasn't hit the Spanish label's website yet, but a larger version is only $675. Here's Victoria Beckham, leaving her NYC hotel with a bag of her own design, a burnt red leather Victoria Beckham Half Moon Bag. Victoria just presented her Fall/Winter 2017 runway show earlier this week. Finally, we have Zoë Kravitz, carrying this perfectly cubic Moynat Small Vanity Box Bag at the premiere of Big Little Lies. I don't think we've given cubes enough credit, collectively.